Deduction & Induction – How do we actually learn best? I started thinking (oh no…) why do we always want to understand “the big picture” first and then formulate our thinking based on readymade pattern someone else has come up with? It has to do with our habits and thinking dating back to our school years. Since kids we have learned there is always some ready answer, theory or theorem that explains all. Wise people have told us what things look like and how the world functions. We learn to trust there is always some higher authority saying what is right and how to understand and intepret the world. Formal school system and all the major educational institutions are built on assumption that we learn best when we are told how things are. There are books, lectures, seminars that utilise the same learning pattern. We are being told. What if we would have been forced to use our brains a bit more? In logical thinking these models are called methods of reasoning typically deductive reasoning and inductive reasoning. Typically we want someone to tell us what is the theory or the model to intepret the phenomena we are trying to understand. From theory or “big picture” we drill down to further details, we try to find some evidence to confirm our newly learned facts and once found we are satisfied that model works. Using this deductive way is how typical learning solutions are built. And it works fine in many occasions however it utilises only some parts of our brain. In inductive learning process (inductive reasoning) we actually use more experience based learning. We observe, we follow, we try, we test and we gather different kind of evidences, opinions, facts and results to start formulating an opinion. We start to see some patterns and repeating behaviors, same test results coming more often. We start to develop a model to explain the phenomena and we start to work on theory that would explain what we experienced. During those learning processes our brains work quite differently and ideal learning paths or learning experiences are built to utilise both deductive and inductive learning. After some careful thinking and maybe even trying it out you start to see where these models work best. We learn in different ways. There are people who can’t be told how things are. They need to be able to figure it out themselves. In some cases there are absolute truths or commonly agreed models we just have to accept. There is no absolute truth here. Why don’t you try to model it for yourself? What is meant by engagement and what can we do to boost it? I started to do some research and studying on “engagement” since that appears to be one of the main concerns for HR and also for people working in various development positions. Keeping people engaged is essential for maintaining good performance levels and also retaining company’s top talents and other key contributors. In the most demanding businesses it is the people asset that would deserve more attention from the senior leadership. The term engagement seems to be fairly loosely defined so I wanted to give this topic a go and look for some brilliant definitions first. In the latter part of my post I’ll share some of my thoughts how we can increase employee engagement via L&D operations. I will also share the list of my source materials from where I copied some of the definitions and examples for my conclusions. Many thanks to original writers for brilliant articles! Employee engagement is the emotional commitment the employee has to the organization and its goals. This emotional commitment means engaged employees actually care about their work and their company. They don’t work just for a paycheck, or just for the next promotion, but work on behalf of the organization’s goals. When employees care—when they are engaged—they use discretionary effort. NOTE! Engagement is two-way: organisations must work to engage the employee, who in turn has a choice about the level of engagement to offer the employer. Social: Is this an organization where I feel involved, part of a good team; is my organization serving the community? Intellectual: Am I able to grow? Is my job stretching and interesting? Do I know what’s happening? Do my opinions count? Emotional: Do I care about the organization and feel I belong? Am I valued? So what is employee engagement? It can be seen as a combination of commitment to the organisation and its values and a willingness to help out colleagues (organisational citizenship). It goes beyond job satisfaction and is not simply motivation. Engagement is something the employee has to offer: it cannot be ‘required’ as part of the employment contract. Employers want engaged employees because they deliver improved business performance. Research has repeatedly demonstrated the links between the way people are managed, employee attitudes and business performance. When employers deliver on their commitments (when by their actions they fulfil employees’ expectations) they reinforce employees’ sense of fairness and trust in the organisation and generate a positive psychological contract between employer and employee. The high performance or ‘black box’ model produced by Bath University builds on the psychological contract but emphasises the role of line managers in creating conditions under which employees will offer ‘discretionary behaviour’. The model recognises that employees have choices and can decide what level of engagement to offer the employer. Please be aware that not every employee will “transform” into a fully engaged employee. With this in mind, focus on employees in positions that are most critical for success for your organization. Look at the factors that influence their engagement and find ways to make improvements. Engaging leadership: “Ensures a strong, transparent, and explicit organizational culture that gives employees a line of sight between their job and the vision and aims of the organization.” Such leaders are strategic, anticipatory, proactive, and people focused. They provide a clear strategic narrative about where the organization is going and why, in a way that gives employees information and insight for their own job. Employee voice: “Employees feel able to voice their ideas and be listened to, both about how to do their job and in decision-making in their own department, with joint sharing of problems and challenges and a commitment to arrive at joint solutions.” In companies that do this well, there is a constant free flow of ideas up and down and across the organization. That requires managers who are willing to listen to people and are not afraid of relinquishing control. Organization lives the values: “A belief among employees that the organization lives the values, and that espoused behavioral norms are adhered to, resulting in trust and a sense of integrity.” In organizations that do this well, values and behaviors are aligned, creating integrity and trust. Any gap between these creates distrust and cynicism. Organizational purpose: In particular, the nature of the organization’s purpose may have a differen­tiating effect on levels of engagement. Research by Holbeche and Springett (2004) into how people experience meaning at work found that an organ­izational purpose that focuses intensely on customers is more likely to engage staff than those focused on shareholders, profits, or a mix of stake­holder needs. However, it is essential that there is a clear line of sight to this purpose in people’s day jobs if the motivational effect is to be achieved. Bureaucracy and inconsistent behaviors, policies, and practices act as barriers and lead to cynicism and disengagement. Act on employee engagement survey findings. 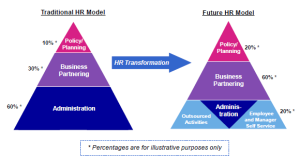 HR brings a method and structure to the system-level data from engagement surveys and other sources such as exit interviews, but the challenge is to individualize this so as not to take a one-size-fits-all approach. So, cut the data based on different groups who share the same (but different from others’) values and needs. Make sure employees know managers take their views seriously, and act on at least the most critical pieces of feedback. This builds trust and shows employees their views are heard and taken seriously. Challenge poor practice. HR needs to ensure the company values are reflected in the standards set, and that these apply to everyone, including the executive team and the board. HR must have the courage of its convictions in tackling poor standards, especially where there are clear gaps between rhetoric and prac­tice on values. Develop engaging management and leadership. Focus on building great leadership and engaging management culture. Address the key topics in talent management and building the company culture. Many organizations are facing potential talent shortages in years to come when global economy is recovering. Company needs to be focused on both retention and on building the talent and leadership pipeline. What helps is that the company is known to be a good employer with great leadership. There needs to be a compelling story on how company is looking after it’s top talent and how committed the company is to developing the top talents and ensuring career progression within the company and supporting other personal development aspirations. As the organizations gear up to deal with today’s more challenging economic conditions, there is growing recognition that the organization culture and the nature of management and leadership need to change to be more nimble and cost effective while retaining its focus on quality, customer, and innovation. Quite a lot has already being said and many of the topics to address should jointly be looked after by line management, senior leadership, HR partners and HR development folks. However with limited resources at hand the companies need to prioritize where to focus on and what to do to address the engagement issues. As I said these are all fine and justified actions but since I am a very development oriented guy I notice that one very important aspect is quite often missing from the list of actions. The reasons may vary from being very resource constrainted to cost savings but it seems many of the companies fail to address the individuals and development needs of the individuals. For obvious reasons many actions are designed to address the masses. One important engagement driver that is often not recognised or addressed properly is the opportunity to develop one’s skills & competencies, the opportunity to grow & develop holistically and the opportunity for career progression. Many of the organisations reserve the opportunity only for top talents or for managers & leaders. Am I able to grow? Is my job stretching and interesting? Do I know what’s happening? Provide opportunities for advancement and communicate them regularly etc. 70 – on the job development and learning (stretch assignments, action learning, problem solving, discussions and coaching with more senior (or junior) colleague, job rotations, shadowing assignments etc. 20 – learning from verbal & written feedback (manager, coaches & colleagues alike), coaching & mentoring, assessments, tests, self-assessments, certifications etc. With 70/20/10 model it should be fairly easy to offer development opportunities for broader employee base that just selected top talents and people on the leadership track. Of course that is just the traditional approach for L&D. In broader sense we should be talking about “employee growth paths” (e.g. Technical Expert Growth Path) which are combinations of functional career ladder, job profile- and role based learning paths and certain transitional development interventions designed to boost career progression and support career advancement by offering needed development opportunities. I’ll write a post on these growth paths later. Another great and tested example of more modern and more inclusive L&D approaches are these Learning 2.0 thinking based facilitated/ managed online learning communities. Those can be open for anyone and can support variety of business critical development needs. These learning communities are very good tools for building engagement in the organization for many reasons. For one they bring together many aspects and drivers of employee engagement and can holistically support boosting the engagement in the organisation. I will write another post of this facilitated online learning communities topic too. There are many possibilities to drive engagement through personal development opportunities so those should not be neglected either. The use of these facilitated online learning communities offers a unique and rich opportunity to boost performance and engagement across the whole workforce. As always your views and comments would be more than welcome!